This is what a packet of McVitie's Milk Chocolate Digestives looks like in Intermarche, and it costs the princely sum of around €3.85, sometimes more. I accept that you have to pay an arm and a leg, but you do get the original fab-tasting biscuit. The other day, one of my friends was in Supermarche Casino and rang me to say she'd found a packet of McVitie's at €1.85. Whoopie doo! She bought it and I went round to get it a few days later. A box. That's not normal, it should be a packet. I delved inside, opened the interior packet and took a bite. Disappointment. It was not a true McVitie's Milk Chocolate Digestive, but a pale imitation. I suspect it's been made especially for the French market and as they'll accept any old digestive rubbish, the recipe has been adapted to these undiscerning tastes. The biscuit itself is tasteless, the chocolate is bland and there's just a measly thin layer where it should be thick and creamy and delicious. Frankly I'm having trouble finishing the box. I went onto McVitie's website to let them know exactly what I thought without having to write a formal letter, print it off, find an envelope and send it by snailmail. They do provide a Contact Us page which is a pain to use and you only have a limited number of characters with which to express your frustrated rage. I wrote a summary, hit Send, and I'm not sure whether it actually went off as I got no receipt or jolly message thanking me for taking the time to contact them. It's a common occurence, of course, adapting foods to local tastes. I remember in Egypt, the Mars Bar was disgusting. It tasted of plastic chocolate and had a tasteless filling. A pointless thing to eat. Rather like these French McVitie's in fact. I certainly won't be buying them again, €1.85 or no €1.85. I would be gracious in victory, natch. Tabasco is the same, I think...dumbed down for France. There's a version of Ty-Phoo tea dumbed down for the Americans, too. Gnat's piss. A year's supply would be glorious indeed. I too was tricked into buying the ghastly things, seduced by their promising packaging and suffered a similar disappointment. I've got a recipe for a passable immitation if you're intrested. On the other hand (and we should take the smooth with the rough) I find the French recipe of full-fat Coke far nicer than the UK one. I'm not sure about the Tabasco: I'd be surprised if the level of sales justified reformulation. However, I note that the fortunate UK based consumer of Tabasco can now choose from a range of three - "Original," mild green or hot-as-hell Scotch Bonnet pepper sauce. Lucky sods. Expat- yeah, the Ty-Phoo is dumbed down here too, so is the Tetley Breakfast - undrinkable in fact. Jon - yes I would be interested in the recipe, thanks ! I'm not a great drinker of Coke, I just know I only like original red, not any of the others. And I prefer it to Pepsi any day. Thank you for your enquiry. We wonder where the biscuits were purchased, UK or France? What is the pack weight, best before date and following batch code. We are not aware of a recipe change, perhaps you have a rogue packet, or is this a regular finding with the product. Funnily enough I've just come back from Intermarche where they have the French boxes in the biccie aisle at €1.70 AND the Real Thing in the British foods section at €4.70 (yes, they've gone up, I did complain to Intermarche but got no response). The €3.85 is for no choccie digestives I now remember. Thanks...I'd bought the ersatz version and they were horrible so I'll write. Yes, Tabasco isn't the same in France...I bought a bottle in the U.k. when I was over and it is the real thng. I have seen a green pepper tabasco, but once bitten several times shy haven't tried it. I don't think this is a rogue packet. I blogged about my disappointment and two other people have said they experienced the same frustration over this pale imitation of a real McVitie's Milk Chocolate Digestive that is to be found in these boxes. The chocolate is not as thick, or as nice as the UK version which is creamier and more delicious, and the biscuit tastes blander too. I simply don't believe they are the same biscuits as the ones in the UK and that we can also buy over here in France in British Foods sections of supermarkets (at €4.70 the packet). Thank you for your reply, the biscuit code you quoted is recognised as product manufactured in the UK. We would like to send you some reimbursement, if I post you some UK vouchers would you be able to use them at all - if you visit the UK in the future? We are not aware of a recipe change, however you state they are pale, which suggests a batch that is underbaked. I'm sure I could make use of the vouchers, thank you. However, the biscuits were not pale, but a pale imitation which means they looked like the original but didn't taste like the original. Jon: I too was tricked into buying the ghastly things, seduced by their promising packaging and suffered a similar disappointment. the fly in the web : Thanks [for the address)...I'd bought the ersatz version and they were horrible so I'll write. 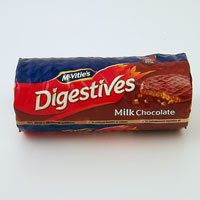 The product might be made in the UK, but the boxed biscuits are not the same as the packet ones. Try them, you'll see. Don't seem keen to say they make them for the French market, do they, wherever they are baked. Award for you over at mine...don't worry about the conditions.. Fly - you're right, Joanne is a tad reticent! I usually avoid these French versions of British food. Remember 'Chester' cheese? Apparently, it was made in the Tarn. Whenever I mention English cheese to French people, they make a face and say 'You mean that red rubbery stuff?'. Gigi, I do remember Chester cheese - foul stuff. I bought it once. At least the ads were good ! Oh cool, Peter, thanks for the link! I got the vouchers, 3 x £3, sure my mother can make use of those with my sweet-toothed Alzheimer dotty dad. Plus a letter along the lines of her email where Joanne shows her ignorance wilfully or otherwise about the expression 'pale imitation'. She insists it was a rogue batch. Believe what you like, Joanne, we know you're ripping us expat Brits off with rubbish designed for undiscerning foreign palates who don't know the difference. I mean, we've been eating them for decades and they insult our palates by trying to fob us off with a substandard biscuit and pretend it's made to the same recipe. Pretend all you like, Joanne and your ilk, WE KNOW the TRUTH, and it AIN'T PRETTY! Well, I've just written to David Fish, Chief Executive of United Biscuits to complain about the sub-standard digestives in France. I also mentioned his employee's ignorance, wilful or otherwise, of the term 'pale imitation'.